You are browsing the archive for OD4TJ. Open Knowledge International coordinates the Open Data for Tax Justice project with the Tax Justice Network, working to create a global network of people and organisations using open data to improve advocacy, journalism and public policy around tax justice. Today, in partnership with the Tax Justice Network, we are publishing Paradise lost, a data-driven investigation looking at who should feature on the forthcoming European Union blacklist of non-cooperative tax jurisdictions. This blogpost has been reposted from the Tax Justice Network site. UK financial services could face heavy penalties after Brexit unless the UK turns back on its aggressive tax haven policies, a new study from the Tax Justice Network has found. The study looks at the new proposals for a EU blacklist of tax havens. The EU has said that it will impose sanctions on countries which find themselves on the list. The EU is due to publish its list of tax havens on 5 December, but analysis by the Tax Justice Network, using the EU’s own criteria, suggests that the UK and 5 other EU countries would find themselves on that list if the criteria were applied equally to them. The EU has stated that the list will only apply to non-EU member states and with the UK set to leave the Union in 2019, this could mean sanctions being applied to the UK unless it changes course and ends policies which make the country a tax haven. This includes the UK’s controlled foreign companies rules which allow UK based multinationals to hoard foreign profits in zero-tax countries. The UK’s CFC rules are currently the subject of a ‘state aid’ investigation by the European Commission. The study also finds that up to 60 jurisdictions could be listed under the EU’s blacklist procedure, if the criteria are strictly applied. But there are fears that intense lobbying by the tax avoidance industry and some countries could see the list severely watered down. In addition to the UK, researchers have identified Ireland, The Netherlands, Cyprus, Luxembourg, Malta as countries that should be included in the blacklist if the EU were to apply its own criteria to member states. Alex Cobham, chief executive of the Tax Justice Network, said: “The EU list is a step forward from previous efforts, in that the criteria are at least partially transparent and so partially objectively verifiable. It’s clear that the UK is at real risk of counter-measures from the EU. The government should forget any Brexit tax haven threat, which could easily open up EU counter-measures like the loss of financial passporting rights, and instead address the flaws in current policies. “But it’s also true that the EU list lacks legitimacy as well as transparency, because it will not apply to its own members. For global progress on a truly level playing field, we need the G77 and G20 to engage in negotiating an international convention that would set an ambitious and fair set of minimum standards, with powerful sanctions, to which all jurisdictions would be held equally to account.” Wouter Lips of Ghent University, who led the study, said: “The EU blacklist represents an important step forward from empty OECD lists – but the criteria need to be completely transparent to be objectively verifiable by independent researchers. Otherwise the risk remains that political power will be a factor in whether countries like the UK or indeed the USA are listed. Many of the 60 countries that are listed are lower-income countries which had no say in the OECD standards upon which much of the EU’s criteria depend, and that raises further questions of fairness.” Please email contact@datafortaxjustice.net if you’d like to be added to the project mailing list or want to join the Open Data for Tax Justice network. You can also follow the #OD4TJ hashtag on Twitter for updates. The release of the Paradise Papers has drawn attention to international calls for greater tax transparency to tackle the issues raised by the leak of millions of documents detailing the offshore behaviour of some of the world’s richest people and corporations. Along with a renewed push for the creation of public beneficial ownership registers to stop the use of anonymous companies for illicit purposes, debate has focused on how a transparency measure called public country-by-country reporting – or public CBCR – may help dissuade multinational corporations from shifting their profits to tax havens or low tax jurisdictions. Calls for action on this issue from campaigners including the Tax Justice Network, Tax Justice UK, Oxfam and Transparency International have been echoed by politicians from Labour leader Jeremy Corbyn and a cross-party selection of UK MPs to MEPs and the European Commission’s Taxation and Customs Union. Some large companies and investors have also spoken out in favour. 78% of British voters would be in favour of public CBCR for multinationals present in UK, according to a new YouGov poll conducted for Oxfam. So what is public CBCR and what steps could politicians take to use it to shine a light on tax avoidance behaviour? CBCR requires that corporations publish information about their economic activities in all of the countries where they operate. This includes information on the taxes they pay, the number of people they employ and the profits they report. In February, as part of our Open Data for Tax Justice project, Open Knowledge International published a white paper co-authored by Alex Cobham, Jonathan Gray and Richard Murphy which examined the prospects for creating a global public database on the tax contributions and economic activities of multinationals as measured by CBCR. This found that such a public database was possible and that a pilot database could be created by bringing together the best existing source of public CBCR information – disclosures made by European Union banking institutions in line with the Capital Requirements Directive IV (CRD IV) passed in 2013. In July, we took the first steps towards the creation of this pilot. While our white paper found that some sources of public CBCR are available now, debates on expanding this measure to apply to a wider range of corporations have been slow to progress in the UK and across Europe. The UK took the lead by legislating in favour of public country-by-country reporting in the 2016 Finance Act. But the final cross-party amendment from Caroline Flint MP did not include an implementation date and the UK government now says it will only “support the development of a public country-by-country reporting model that operates on a multilateral basis”. In July 2017, the European Parliament voted in favour of requiring all large multinational corporations to publish public CBCR information as open data. But this issue has now been passed over to the Council of the European Union for them to consider how to proceed and it is unclear how or when a decision by EU member states will be taken. The issue will continue to be debated in coming weeks. On 22nd November, Nigel Mills MP will lead a debate on public CBCR at the Houses of Parliament in the UK. Oxfam have called on the UK government to enforce comprehensive public CBCR for UK companies by the end of 2019. Shortly afterwards, a special Paradise Papers hearing will be held at the European Parliament on 28th November. And in early December, the final recommendations from the Panama Papers committee at the European Parliament which call for “the need of an ambitious public country-by-country reporting (CBCR) in order to enhance tax transparency and public scrutiny of multinational enterprises (MNEs)” are due to be voted on by MEPs. To tackle the issues exposed by the Paradise Papers, we urge the UK government to take the lead by putting their 2016 powers into action and encourage the European Parliament and EU Council to endorse swift moves towards public CBCR to help expose and tackle profit shifting by multinational corporations. Please email contact@datafortaxjustice.net if you’d like to be added to the Open Data for Tax Justice mailing list or want to join the Open Data for Tax Justice network. You can also follow the #OD4TJ hashtag on Twitter for updates. Tax avoidance and profit shifting by corporations across the world is an issue which has been gaining visibility over the past decade with many governments, campaigners, researchers and journalists calling for urgent political action. These calls have only gotten louder following recent reporting on scandals such as Luxleaks and the Panama Papers by the International Consortium of Investigative Journalists. On 30th May 2017, members of the European Parliament have the chance to vote in favour of amendments aimed at forcing Europe’s largest multinational corporations to be more transparent about the tax they pay and their operations in different countries. This would be achieved by getting the companies to release public country-by-country reporting. Despite setbacks and proposals to water down other tabled amendments, MEPs seem likely to back the amendments calling for country-by-country reporting information to be released to the public “in a common template available in an open data format”. Open Knowledge International hope that MEPs will back these open data amendments to help unlock the value of this key information. So what is country-by-country reporting and why should it be public rather than being privately reported to tax authorities? Country-by-country reporting is a transparency requirement which forces large multinational corporations to publish information about their economic activities in all of the countries where they operate. This includes information on the taxes they pay, the number of people they employ and the profits they report. By legislating greater transparency around tax affairs via mechanisms like country-by-country reporting, the international community wants to tackle tax avoidance and ensure that companies pay the correct amount of tax in line with their activities in any given country. These efforts – spearheaded by the ongoing OECD Base Erosion and Project Shifting (BEPS) project – are focused on helping countries grow their tax bases and benefit more from economic activity carried out in their jurisdictions. But the BEPS project mandates that corporations’ country-by-country reporting information should be kept private, shared only with the tax authority in the country where they are headquartered and other countries which have tax information-sharing deals in place. The public would have no right to access this information. We believe that a lack of transparency in current country-by-country reporting standards will fail to build confidence in the fair tax treatment of high-profile taxpayers, missing an important opportunity to build tax morale and wider public support for tax compliance. Research has shown how restricting access to country-by-country reporting exacerbates global inequalities in taxing rights while a recent joint briefing by 14 civil society organisations set out why public country-by-country reporting is a must for large multinationals to create an “effective deterrent of aggressive tax avoidance and profit shifting”. For the Open Data for Tax Justice project, Open Knowledge International partnered with the Tax Justice Network and the Financial Transparency Coalition to create a global network of people using open data to improve advocacy and public policy around tax justice issues such as public CBCR. In February 2017, our white paper – What Do They Pay? – laid out how to create a public database of country-by-country reporting information to account for the economic activities and tax contributions of multinational corporations. And to demonstrate how public country-by-country reporting released as open data can be of great value to a wide range of actors, Open Knowledge International is currently planning work over the next couple of months to take solid steps towards the creation of this database. We hope that MEPs vote in favour of the public country-by-country reporting open data amendments next week and look forwards to bringing our expertise with open fiscal data to bear to help people make use of this data in future. Find out more about our Open Data for Tax Justice project at datafortaxjustice.net where you can also read our white paper on laying out a roadmap towards a public database to account for the economic activities and tax contributions of multinational corporations. Email contact@datafortaxjustice.net if you’d like to be added to our project mailing list or follow the #OD4TJ hashtag on Twitter. A new research report published today looks at the current state and future prospects of a global public database of corporate accounts. The multinational corporation has become one of the most powerful and influential forms of economic organisation in the modern world. Emerging at the bleeding edge of colonial expansion in the seventeenth century, entities such as the Dutch and British East India Companies required novel kinds of legal, political, economic and administrative work to hold their sprawling networks of people, objects, resources, activities and information together across borders. Today it is estimated that over two thirds of the world’s hundred biggest economic entities are corporations rather than countries. Our lives are permeated by and entangled with the activities and fruits of these multinationals. We are surrounded by their products, technologies, platforms, apps, logos, retailers, advertisements, publications, packaging, supply chains, infrastructures, furnishings and fashions. In many countries they have assumed the task of supplying societies with water, food, heat, clothing, transport, electricity, connectivity, information, entertainment and sociality. We carry their trackers and technologies in our pockets and on our screens. They provide us not only with luxuries and frivolities, but the means to get by and to flourish as human beings in the contemporary world. They guide us through our lives, both figuratively and literally. The rise of new technologies means that corporations may often have more data about us than states do – and more data than we have about ourselves. But what do we know about them? What are these multinational entities – and where are they? What do they bring together? What role do they play in our economies and societies? Are their tax contributions commensurate with their profits and activities? Where should we look to inform legal, economic and policy measures to shape their activities for the benefit of society, not just shareholders? At the moment these questions are surprisingly difficult to answer – at least in part due to a lack of publicly available information. We are currently on the brink of a number of important policy decisions (e.g. at the EU and in the UK) which will have a lasting effect on what we are able to know and how we are able to respond to these mysterious multinational giants. A wave of high-profile public controversies, mobilisations and interventions around the tax affairs of multinationals followed in the wake of the 2007-2008 financial crisis. Tax justice and anti-austerity activists have occupied high street stores in order to protest multinational tax avoidance. A group of local traders in Wales sought to move their town offshore, in order to publicise and critique legal and accountancy practices used by multinationals. One artist issued fake certificates of incorporation for Cayman Island companies to highlight the social costs of tax avoidance. Corporate tax avoidance came to epitomise economic globalisation with an absence of corresponding democratic societal controls. This public concern after the crisis prompted a succession of projects from various transnational groups and institutions. The then-G8 and G20 committed to reducing the “misalignment” between the activities and profits of multinationals. The G20 tasked the OECD with launching an initiative dedicated to tackling tax “Base Erosion and Profit Shifting” (BEPS). The OECD BEPS project surfaced different ways of understanding and accounting for multinational companies – including questions such as what they are, where they are, how to calculate where they should pay money, and by whom they should be governed. For example, many industry associations, companies, institutions and audit firms advocated sticking to the “arms length principle” which would treat multinationals as a group of effectively independent legal entities. On the other hand, civil society groups and researchers called for “unitary taxation”, which would treat multinationals as a single entity with operations in multiple countries. The consultation also raised questions about the governance of transnational tax policy, with some groups arguing that responsibility should shift from the OECD to the United Nations to ensure that all countries have a say – especially those in the Global South. While many civil society actors highlighted the shortcomings and limitations of the OECD BEPS process, they acknowledged that it did succeed in obtaining global institutional recognition for a proposal which had been central to the “tax justice” agenda for the previous decade: “Country by Country Reporting” (CBCR), which would require multinationals to produce comprehensive, global reports on their economic activities and tax contributions, broken down by country. But there was one major drawback: it was suggested that this information should be shared between tax authorities, rather than being made public. Since the release of the the OECD BEPS final reports in 2015, a loose-knit network of campaigners have been busy working to make this data public. Today we are publishing a new research report looking at the current state and future prospects of a global database on the economic activities and tax contributions of multinationals – including who might use it and how, what it could and should contain, the extent to which one could already start building such a database using publicly available sources, and next steps for policy, advocacy and technical work. It also highlights what is involved in making of data about multinationals, including social and political processes of classification and standardisation that this data depends on. The report reviews several public sources of CBCR data – including from legislation introduced in the wake of the financial crisis. Under the Trump administration, the US is currently in the process of repealing and dismantling key parts of the Dodd-Frank Wall Street Reform and Consumer Protection Act, including Section 1504 on transparency in the extractive industry, which Oxfam recently described as the “brutal loss of 10 years of work”. Some of the best available public CBCR data is generated as a result of the European Capital Requirements Directive IV (CRD IV), which gives us an unprecedented (albeit often imperfect) series of snapshots of multinational financial institutions with operations in Europe. Rapporteurs at the European Parliament just published an encouraging draft in support of making country-by-country reporting data public. While the longer term dream for many is a global public database housed at the United Nations, until this is realised civil society groups may build their own. As well as being used as an informational resource in itself, such a database could be seen as form of “data activism” to change what public institutions count – taking a cue from citizen and civil society data projects to take measure of issues they care about – from migrant deaths to police killings, literacy rates, water access or fracking pollution. A civil society database could play another important role: it could be a means to facilitate the assembly and coordination of different actors who share an interest in the economic activities of multinationals. It would thus be not only a source of information, but also a mechanism for organisation – allowing journalists, researchers, civil society organisations and others to collaborate around the collection, verification, analysis and interpretation of this data. In parallel to ongoing campaigns for public data, a civil society database could thus be viewed as a kind of democratic experiment opening up space for public engagement, deliberation and imagination around how the global economy is organised, and how it might be organised differently. In the face of an onslaught of nationalist challenges to political and economic world-making projects of the previous century – not least through the “neoliberal protectionism” of the Trump administration – supporting the development of transnational democratic publics with an interest in understanding and responding to some of the world’s biggest economic actors is surely an urgent task. Launched in 2016, supported by a grant from Omidyar Network, the FTC and coordinated by TJN and OKI, Open Data for Tax Justice is a project to create a global network of people and organisations using open data to improve advocacy, journalism and public policy around tax justice. More details about the project and its members can be found at datafortaxjustice.net. This piece is cross-posted at OpenDemocracy. Comments Off on How could a global public database help to tackle corporate tax avoidance? Open Knowledge International is coordinating the Open Data for Tax Justice project in partnership with the Tax Justice Network to create a global network of people and organisations using open data to inform local and global efforts around tax justice. Tax evasion, corruption and illicit financial flows rob countries around the world of billions in revenue which could be spent on improving life for citizens. That much can be agreed. But how many billions are lost, who is responsible and which countries are worst affected? Those are difficult questions to answer given the lack of transparency and public disclosure in many tax jurisdictions. The consensus is that it is the economies of the world’s poorest countries which are proportionally most affected by this revenue loss, with African governments estimated to be losing between $30 billion and $60 billion a year to tax evasion or illicit financial flows, according to a 2015 report commissioned by the African Union and United Nations. International bodies have been slow to produce solutions which fight for the equitable sharing of tax revenues with lobbying leading to a retrenchment of proposed transparency measures and scuppering efforts to create a global tax body under the auspices of the UN. More transparency and public information is needed to understand the true extent of these issues. To that end, Open Knowledge International is coordinating the Open Data for Tax Justice project with the Tax Justice Network to create a global network of people and organisations using open data to improve advocacy, journalism and public policy around tax justice. And last week, I joined the third iteration of the International Tax Justice Academy, organised by the Tax Justice Network – Africa, to connect with advocates working to shed light on these issues across Africa. The picture they painted over three days was bleak: Dr Dereje Alemayehu laid out how the views of African countries had been marginalised or ignored in international tax negotiations due in part to a lack of strong regional power blocs; Jane Nalunga of SEATINI-Uganda bemoaned politicians who continue to “talk left, walk right” when it comes to taking action on cracking down on corrupt or illicit practices; and Professor Patrick Bond of South Africa’s Witwatersrand School of Governance foresaw a rise in violent economic protests across Africa as people become more and more aware of how their natural capital is being eroded. Several speakers said that an absence of data, low public awareness, lack of political will and poor national or regional coordination all hampered efforts to generate action on illicit financial flows in countries across Africa. Everyone agreed that these debates are not helped by the opacity of key tax terms like transfer pricing, country-by-country reporting and beneficial ownership. The governments of South Africa, Nigeria, Kenya and Tanzania may have all publicly pledged measures like creating beneficial ownership registers to stop individuals hiding their wealth or activities behind anonymous company structures. But at the same time a key concern of those attending the academy was the closing of civic space in many countries across the continent making it harder for them to carry out their work and investigate such activities. Michael Otieno of the Tax Justice Network – Africa told delegates that they should set the advocacy agenda around tax to ensure that human rights and development issues could be understood by the public in the context of how taxes are collected, allocated and spent. He encouraged all those present to combine forces by adding their voices to the Stop the Bleeding campaign to end illicit financial flows from Africa. Through our Open Data for Tax Justice project, Open Knowledge International will be looking to incorporate the views of more civil society groups, advocates and public policy makers like those at the tax justice academy into our work. If you would like to join us or learn more about the project, please email contact@datafortaxjustice.net. Todo ano países perdem bilhões de dólares em elisão fiscal, evasão fiscal e, mais geralmente, para fluxos financeiros ilícitos. De acordo com uma recente estimativa do FMI, cerca de 700 bilhões de dólares em receitas fiscais são perdidos a cada ano devido ao deslocamento de lucros. Nos países em desenvolvimento, a perda é estimada em cerca de 200 bilhões de dólares, o que, em percentagem do PIB, representa quase três vezes o prejuízo sofrido pelos países da OCDE. O economista Gabriel Zucman estima que certos componentes de fortunas offshore (em paraísos fiscais) não declarados totalizam acima de 7 trilhões de dólares, o que implica em prejuízos fiscais de 200 bilhões de dólares por ano; o trabalho de Jim Henry para TJN (Tax Justice Network – Rede de Justiça Fiscal) sugere que o total completo de ativos offshore pode variar entre 21 e 32 trilhões de dólares. O lançamento dos Panama Papers (documentos do Panamá) no último domingo (03/04) talvez ajude a corroborar essa estimativa. Segundo matéria do Portal Terra, os 11,5 milhões de documentos (2,6 terabytes de dados) vazados da consultoria Mossack Fonseca, quarta maior empresa de advocacia offshore do mundo, podem revelar detalhes de centenas de milhares de clientes que utilizam paraísos fiscais no exterior supostamente para evasão fiscal, lavagem de dinheiro, tráfico de drogas e armas. De acordo com uma reportagem feita por Fernando Rodrigues, um dos jornalistas participantes do Consórcio Internacional de Jornalistas Investigativos (ICIJ, na sigla original, consórcio com o qual o jornal alemão Süddeutsche Zeitung dividiu os vazamentos do Mossack Fonseca), 107 novas offshores ligadas a citados na Lava Jato surgiram nos Panama Papers. Até agora, afirma Rodrigues, estas firmas não foram mencionadas pelos investigadores brasileiros que cuidam da operação. Como aponta o jornalista em sua reportagem, “ter uma empresa offshore não é ilegal, desde que a empresa seja devidamente declarada no Imposto de Renda”. O cruzamento desses dados com dados da Receita Federal poderão permitir descobrir quem driblou a lei. Entendendo a importância desse assunto e, antes mesmo do surgimento dos Panama Papers, a Open Knowledge e a Tax Justice Network anunciaram, no início de março, o lançamento de uma nova iniciativa a fim de jogar luz na área de dados fiscais: Open Data for Tax Justice (Dados Abertos para a Justiça Fiscal). As instituições manifestaram o desejo de iniciar uma rede global de pessoas e organizações que trabalham para criar, usar e compartilhar dados para melhorar a militância e jornalismo em torno de justiça fiscal. O site é: http://datafortaxjustice.net/ e a hashtag #od4tj está ativa no Twitter. A rede pretende reunir ativistas, grupos da sociedade civil, jornalistas investigativos, jornalistas de dados, hackers cívicos, pesquisadores, funcionários públicos e outros, e tem como objetivo catalisar colaborações e alianças duradouras entre o movimento de justiça fiscal e do movimento de dados abertos. A iniciativa tem recebido um grande nível de apoio e incentivo por meio de discussões preliminares com seus membros iniciais, buscando expandir tanto sua rede como suas atividades nos próximos meses. O que o futuro reserva? Atualmente, a Open Knowledge e a Tax Justice Network estão trabalhando em um rascunho sobre como uma infraestrutura global de dados para a justiça fiscal deveria se parecer. Gerar materiais de orientação mais prática para projetos de dados – bem como ganhar impulso com eventos online e offline também está nos planos. Algumas atividades preliminares a nível global no Open Data Day (Dia dos Dados Abertos) deste ano, em 05 de março, foram realizadas. A justiça fiscal foi um dos temas principais do Open Data Day em Londres e você já pode conferir algumas das discussões que antecederam o evento e participar do fórum sobre o tema aqui [apenas em inglês]. Todo ano países perdem bilhões de dólares em elisão fiscal, evasão fiscal e, mais geralmente, para fluxos financeiros ilícitos. De acordo com uma recente estimativa do FMI, cerca de 700 bilhões de dólares em receitas fiscais são perdidos a cada ano devido ao deslocamento de lucros. Nos países em desenvolvimento, a perda é estimada em cerca de 200 bilhões de dólares, o que, em percentagem do PIB, representa quase três vezes o prejuízo sofrido pelos países da OCDE. O economista Gabriel Zucman estima que certos componentes de fortunas offshore (em paraísos fiscais) não declarados totalizam acima de 7 trilhões de dólares, o que implica em prejuízos fiscais de 200 bilhões de dólares por ano; o trabalho de Jim Henry para TJN (Tax Justice Network – Rede de Justiça Fiscal) sugere que o total completo de ativos offshore pode variar entre 21 e 32 trilhões de dólares. O lançamento dos Panama Papers (documentos do Panamá) no último domingo (03/04) talvez ajude a corroborar essa estimativa. Segundo matéria do Portal Terra, os 11,5 milhões de documentos (2,6 terabytes de dados) vazados da consultoria Mossack Fonseca, quarta maior empresa de advocacia offshore do mundo, podem revelar detalhes de centenas de milhares de clientes que utilizam paraísos fiscais no exterior supostamente para evasão fiscal, lavagem de dinheiro, tráfico de drogas e armas. De acordo com uma reportagem feita por Fernando Rodrigues, um dos jornalistas participantes do Consórcio Internacional de Jornalistas Investigativos (ICIJ, na sigla original, consórcio com o qual o jornal alemão Süddeutsche Zeitung dividiu os vazamentos do Mossack Fonseca), 107 novas offshores ligadas a citados na Lava Jato surgiram nos Panama Papers. Até agora, afirma Rodrigues, estas firmas não foram mencionadas pelos investigadores brasileiros que cuidam da operação. Como aponta o jornalista em sua reportagem, “ter uma empresa offshore não é ilegal, desde que a empresa seja devidamente declarada no Imposto de Renda”. Entendendo a importância desse assunto e, antes mesmo do surgimento dos Panama Papers, a Open Knowledge e a Tax Justice Network anunciaram, no início de março, o lançamento de uma nova iniciativa a fim de jogar luz na área de dados fiscais: Open Data for Tax Justice (Dados Abertos para a Justiça Fiscal). As instituições manifestaram o desejo de iniciar uma rede global de pessoas e organizações que trabalham para criar, usar e compartilhar dados para melhorar a militância e jornalismo em torno de justiça fiscal. O site é: http://datafortaxjustice.net/ e a hashtag #od4tj está ativa no Twitter. Every year countries lose billions of dollars to tax avoidance, tax evasion and more generally to illicit financial flows. According to a recent IMF estimate around $700 billion of tax revenues is lost each year due to profit-shifting. In developing countries the loss is estimated to be around $200 billion, which as a share of GDP represents nearly three times the loss suffered by OECD countries. Meanwhile, economist Gabriel Zucman estimates that certain components of undeclared offshore wealth total above $7 trillion, implying tax losses of $200 billion annually; Jim Henry’s work for TJN suggests the full total of offshore assets may range between $21 trillion and $32 trillion. We want to transform the way that data is used for advocacy, journalism and public policy to address this urgent challenge by creating of a global network of civil society groups, investigative reporters, data journalists, civic hackers, researchers, public servants and others. Today, Open Knowledge and the Tax Justice Network are delighted to announce the launch of a new initiative in this area: Open Data for Tax Justice. 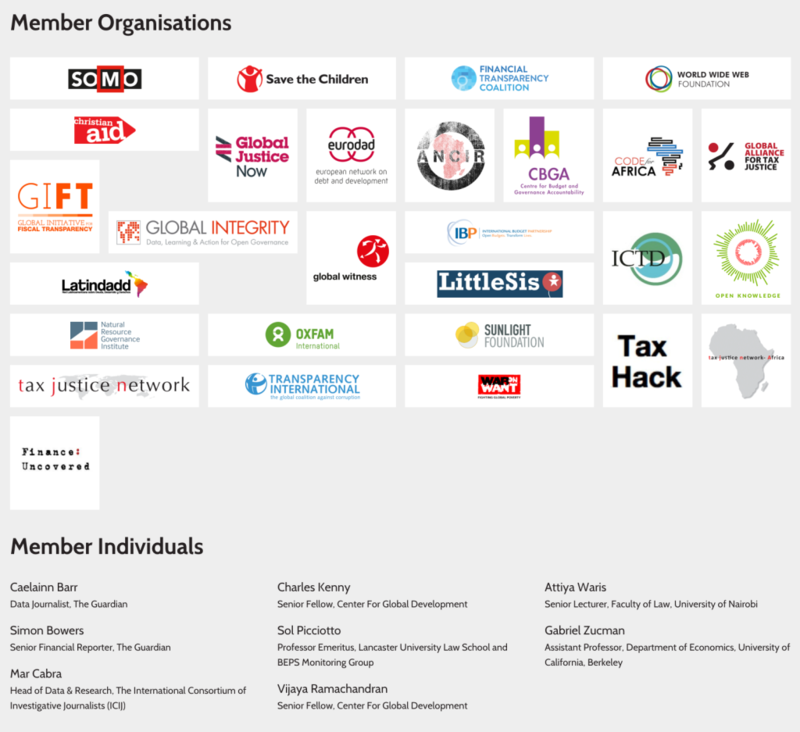 We want to initiate a global network of people and organisations working to create, use and share data to improve advocacy and journalism around tax justice. The website is: http://datafortaxjustice.net/ and using the hashtag #od4tj. The network will work to rally campaigners, civil society groups, investigative reporters, data journalists, civic hackers, researchers, public servants and others; it will aim to catalyse collaborations and forge lasting alliances between the tax justice movement and the open data movement. We have received a huge level of support and encouragement from preliminary discussions with our initial members, and look forward to expanding the network and its activities over the coming months. What is on the cards? We’re working on a white paper on what a global data infrastructure for tax justice might look like. We also want to generate more practical guidance materials for data projects – as well as to build momentum with online and offline events. We will kick off with some preliminary activities at this year’s global Open Data Day on Saturday 5th March. Tax justice will be one of the main themes of the London Open Data Day, and if you’d like to have a go at doing something tax related at an event that you’re going to, you can join the discussion here.